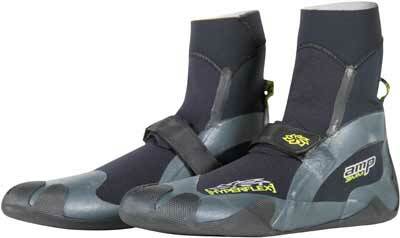 The AMP boot is a high-performing and feature rich surf boot. Building on over a decade of success, the AMP boot design has stood the test of time. This didn't stop us improving it yet again. The fit and finish is better than ever, and we gave it features that keep you warmer, more comfortable, and surfing as though you were barefoot. If you want the best, go with the AMP boot. AMP-Foam neoprene engineered for improved warmth and durability with focus on comfort and complete flexibility for maximum range of motion and control. DiamondSkin Sole provides excellent traction and protection without losing feeling and control. Miniature diamond-shaped channels provide consistent grip in all directions while allowing water to migrate away from in-between the boot and the board. ExoShell+ Membrane a vulcanized heel lock membrane structure that connects to the upper arch strap for maximum adjustability, fit and support. P4 Thermal Lining soft microfiber fleece for extra cushion and comfort with heat boosting insulation properties. TaperLock™ Closure a high-stretch, tapered panel sewn on the boot entry that limits cold-water flushing while also improving ease of entry/exit.